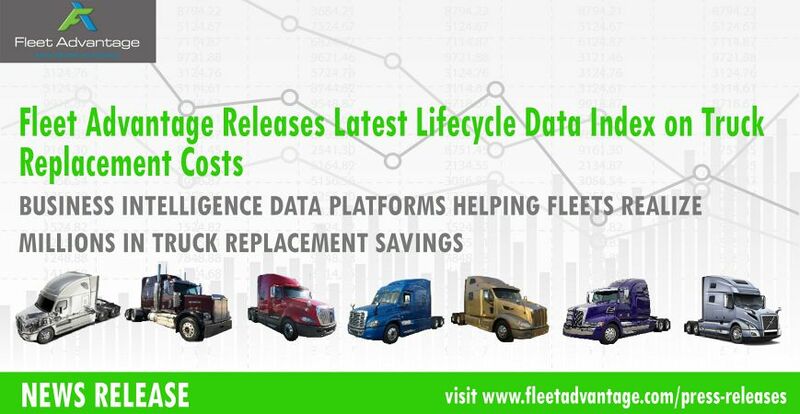 FORT LAUDERDALE, FL (March 28, 2019) – Fleet Advantage, a leading innovator in truck fleet business analytics, equipment financing, and lifecycle cost management made public today its Q1 2019 Truck Lifecycle Data Index (TLDI) comparing all-in operating costs of early-model Class-8 trucks to 2020 model-year replacements. The TLDI shows significant cost savings when replacing older-model vehicles with 2020 MY trucks. According to Fleet Advantage’s ATLAAS Unified (Advanced Truck Lifecycle Administrative Analytics Software), the TLDI shows that fleet operators can realize a first-year per-truck savings of $16,928 when upgrading from a 2015 sleeper model-year truck to a 2020 model. For a fleet of 100 trucks, when upgrading to a 2020 MY savings can reach $1.7 million. Fuel savings account for a large portion of the savings. In fact, fleets can save $6,048 in the first year of fuel expenditures when replacing a 2015 MY sleeper, representing a 12% increase in fuel economy and reduction of CO2 emissions. Maintenance and repair also offer significant savings. These comparisons are critical in helping fleet operators determine future procurement plans, including finding the “TIPPINGPOINT®” – the point at which a truck reaches economic obsolescence, and costs more to operate than to replace with newer equipment. Truck procurement philosophies have been shifting through the years, and many organizations now analyze a fleet’s lifecycle and operating costs as variable vs. fixed, which allows for easier budgeting and forecasting. A longer-term lifecycle of a vehicle means organizations have higher variable and unpredictable costs – maintenance, fuel expenditure, and repair, etc. ; whereas a shorter lifecycle of two trucks equaling the same time frame will result in substantially lower fuel and maintenance costs, which far exceed the slight increase in the initial fixed cost (due to the market price of the second asset) and is much less expensive over time. Fleet Advantage serves America’s top truck fleets and guarantees the absolute lowest cost of operation by providing truck leasing and matching proprietary data driven IT processes with fleet analytics using the latest eco-efficient clean diesel technology to achieve optimum vehicle productivity, while reducing operating costs. Fleet Advantage is ranked as one of the fastest-growing privately held companies in the state of Florida and the fastest growing independent truck lessor in the U.S. In 2018, Fleet Advantage was ranked the 9th Top Private Independent from Monitor Daily; and in 2015 and 2013, the company was named to Inc. magazines’ 500|5000 list of fastest growing companies in the nation. In 2011, CEO John Flynn received the Ernst & Young Entrepreneur of the Year® 2011 Florida - Emerging Category award.